Betaout, Shimla based startup who are focused on creating solutions for web publishers have come out with a new product called Amplify Connect. Simply put, Amplify Connect is a widget created for online businesses and website owners, to interact and engage with their online visitors. It differs from the regular chat and feedback widgets that you see on the web. The core of Amplify connect is to present the human face behind the website brand. In traditional chat widgets, you can leave a feedback or even have a online chat, without really knowing who is on the other side. But with Amplify connect, website visitors can actually see the name and avatar of people and choose to have a conversation with whom they want. How Amplify Connect can help? Bi-directional User Feedback: Feedback widgets, Contact Us forms etc are seen by web visitors as one-way conversations. Users after filling up a form are not even sure if they will receive a reply. But with Amplify Connect these feedbacks are turned into conversations and stored in a personalized user-inbox for every user. Pro-active User Engagement: Less than 0.5% users on any site submits a feedback or fill up a contact form. So instead of waiting for users to contact you, why not greet them with a custom message when they pay you a visit. Powerful customer support: Given the way Amplify Connect is built, it can easily be used as a powerful customer support tool for website owners. 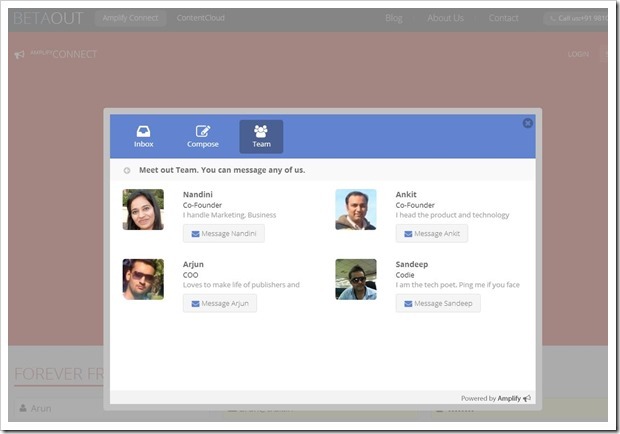 It allows to easily assign the conversations and support requests to other team members. In addition to this, Amplify connect can also help in marketing by getting your messages across to customers through their personalised inboxes on your site. Thanks Arun for the review. And Gaurav feel free to reach us on Amplify Connect if you need any help. Amplify Connect looks interesting. I have signed up for it and will use it on my site. Hope the visitors found it useful too.